Following in the footsteps of Jules Verne’s Phileas Fogg, MSC Cruises has announced its first-ever World Cruise. While Phileas Fogg and his trusted companion Passepartout were engaged in a race aginst the clock, trying to travel around the world by train in 80 days, MSCCruises is taking a more relaxed approach. Departing from Genoa on 5 January 2019 MSC Magnifica will complete her around-the-world voyage in 119 days. Crossing six continents, calling at 49 unique destinations in 32 countries, this one-of-a-kind world cruise will be an unforgettable dream come true. 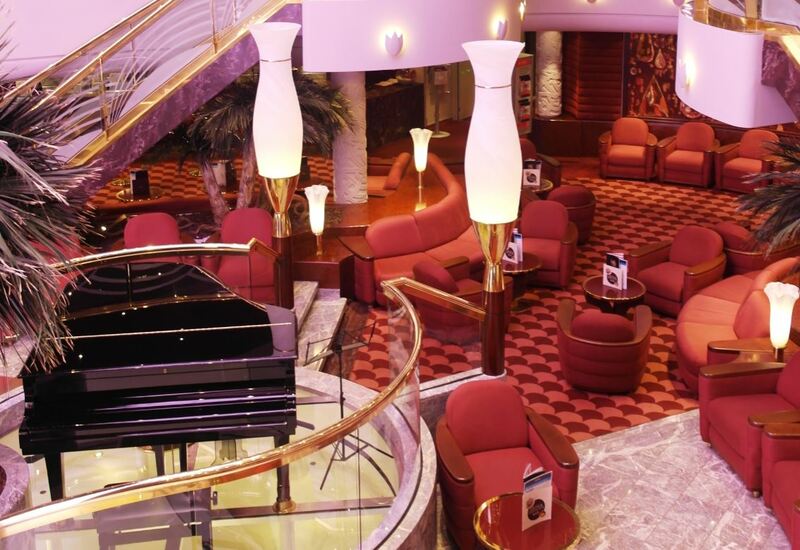 Guests will also have the opportunity to embark/disembark in Civitavecchia/Rome, Marseille and Barcelona. Throughout the 119 day globetrotting voyage, guests will visit some of the most historic ports, bustling cosmopolitan cities and remote, exotic island paradises around the globe. 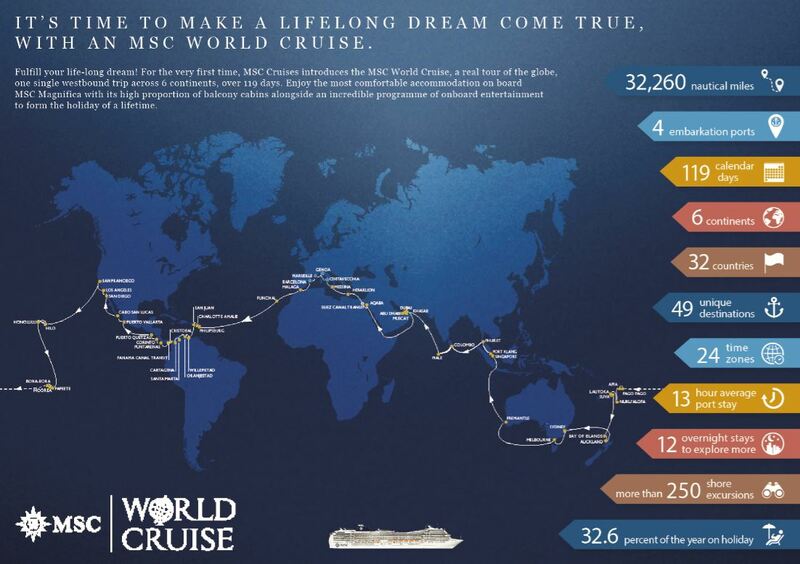 The MSC World Cruise will allow even the more demanding voyagers to experience the world like never before. Exclusive and unprecedented shore experiences: MSC Cruises continues in its commitment to providing authentic experiences to satisfy the needs of all guests with an extensive choice of excursions. Whether riding the elephants of Pinnawela, snorkelling in the lagoons of Moorea or touring the Nga Bay National Park, guests are able to immerse themselves in local culture and experience the best that each destination has to offer. Furthermore, exclusive to MSC World Cruise, guests will be able to book 15 complimentary shore excursions of their choice to really explore the globe like never before. While there are plenty of activities to enjoy at sea, guests can also opt to escape to relaxation at one of the many on board havens. This includes MSC Magnifica’s Aurea Spa, with traditional Balinese massages in addition to a number of other ultramodern beauty treatments, a sauna, Turkish bath and thalassotherapy room. MSC Voyagers Club members who book now can benefit from a free mealtime drinks package as well as triple membership points at time of booking, allowing them to enjoy all the added benefits right away. Guests who are not already an MSC Voyagers Club member, but are in possession of a loyalty card from another leading travel reward programme can join the MSC Voyagers Club at a similar or higher level thanks to MSC Status Match. Whether it be the traditional gap year, career break or a post-retirement adventure, travellers of all ages will be able to broaden their horizons and gain valuable life experiences by travelling around the world onboard MSC Magnifica. Having created this unique voyage with stops in the Caribbean islands of Saint Lucia and Granada, visits to Venezuela, Aruba and Colombia and the Hawaiian islands, followed by Tahiti, Bora Bora and Sydney this cruise around the world is going to be a trully unique experience.